A little over a week ago, I had someone write and ask me if I had any Purposeful Talk anchor charts available. I didn't, so I tried to find her some online. But I couldn't find any with the Spanish version. So after doing a bit of research, I made these. 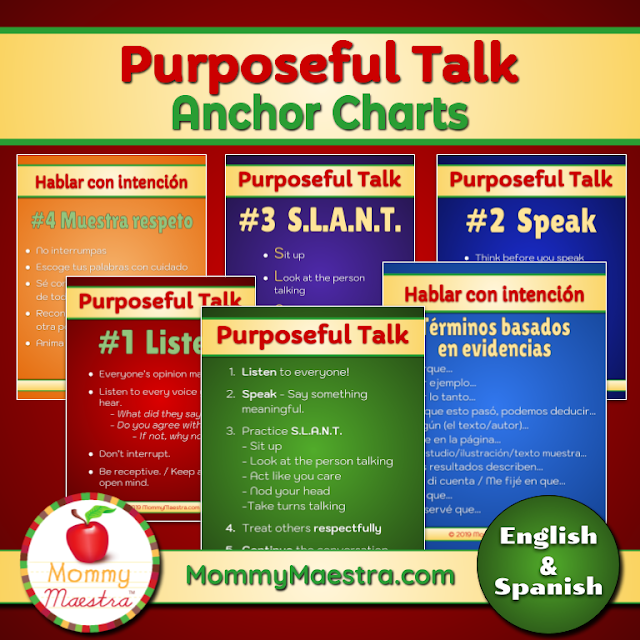 The struggle I had, though, came when I was putting the Spanish version together because after talking with several teacher friends and asking in a group, I realized that different districts use different terminology for "Purposeful Talk." Some were more laid back with "Una charla intencionada," while others used a more formal "Conversaciones académicas." In the end, I went middle of the road with "Hablar con intención," but if you are a teacher who uses one of the other phrases (or something completely different), just drop me an email and I'll be happy to change the titles for you to reflect the language you use in your classroom. You can find these new posters/anchor charts in my TpT store. And while we are on the subject, I want to remind you that if there is a particular printable that you'd like to see created or are looking to use with your students, but you can't find what you are looking for, don't hesitate to email me. I'm always open to suggestions and happy to create something just for you.